While the electric vehicle industry is growing — sales increased by 37 percent in 2016 — it still faces many challenges. Why? Just as gas-powered vehicles rely on gas stations, electric cars depend on charging stations. And since electric vehicles are still a minority on the roadway, many state roads and highways aren’t equipped to match the needs of this growing market. While federal regulations for emissions and decreased federal financial incentives for consumers have the potential to slow the growth of this market, Pennsylvania is doing what it can, at the state level, to keep the industry robust and growing. New state legislation and state incentives are making electric cars a more accessible choice for drivers in Pennsylvania. Pennsylvania continues to demonstrate support for alternative energy, including solar power & electric vehicles, both producing zero emissions. A recent program called “Finding Pennsylvania’s Solar Future” seeks to promote an increase in the state’s solar energy production. In 2016, the program was awarded a $550,000 grant from the U.S. Department of Energy to help Pennsylvania achieve it’s 2030 solar goal of 10 percent in-state electricity sales generated by in-state solar energy. Participants in this statewide solar energy initiative will help analyze models of current and potential solar energy development to forecast what Pennsylvania’s solar energy could look like in 2030 if the goal is achieved. Today approximately 0.15% of electricity in the state comes from solar power generated inside the state and no more than a total of 1.0% of electricity used in PA comes from solar. The Solar Future work group is exploring opportunities and challenges as they consider the best direction to achieve plan goals. The solar industry currently employs over 4,600 people which is more than the coal, wind and natural gas sectors. Contributing to the growing presence of the solar industry here in PA; and making significant advancements in solar panels is SolarCity, a part of Tesla Motors, Inc. (a leader in innovative electric cars). 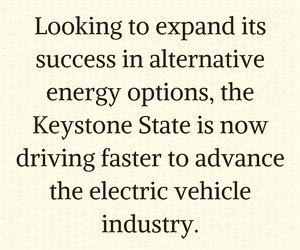 Looking to expand its success in alternative energy options, the Keystone State is now driving faster to advance the electric vehicle industry. In 2017, legislation was introduced to build more charging stations across major cities and roads. House Bill 1446 proposed establishing a statewide goal of expanding electric transportation by working with the electric utilities to design and develop a useful network of electric charging stations along the interstate and PA highways and turnpike. According to the bill, this goal must take into consideration 2030 market forecasts, with the set target being at least 50 percent of the annual electric transport predictions for 2030. As of 2017, market forecasts for 2030 vary due to the shifting prices of electric vehicles, cost of their parts and charging station availability. Electric car components like batteries, for example, are seeing a 20 percent drop in price each year. And the U.S. Energy Information Administration has reduced its anticipated 2025 price for electric, long-range compact vehicles by more than $10,000 from its 2016 estimate. A valuable aspect of expanded battery storage is that batteries double as energy storage for the grid during high demand and can charge when energy demand is low. Interesting note: One of the reasons, Tesla’s new production vehicles costs have dropped is due to technology advancements developed within their own battery plant in Sparks, Nevada. So what will Pennsylvania’s 2030 goal be? If House Bill 1446 passes, it allows 180 days for research and preparation in setting a target as well as establishing optional regional goals across the state. 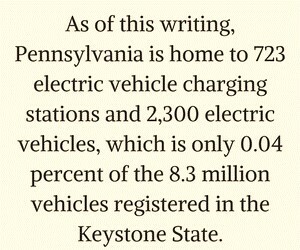 As of this writing, Pennsylvania is home to 723 electric vehicle charging stations and 2,300 electric vehicles, which is only 0.04 percent of the 8.3 million vehicles registered in the Keystone State. If Pennsylvania chooses to expand its network of charging stations, it will solve a significant challenge for electric car owners: traveling long distances. Consider an alternate scenario if these were the only locations to offer gas. Obviously, any kind of scarcity for refueling options limits the propensity and desire to travel long distances. Just like gas-powered vehicles, electric cars offer a long-term economic boost, such as through repairs, maintenance and charging stations. Right now, though, 80 percent of drivers are charging their cars at home. In a single charge, the average electric car can travel 240 miles. Now, take a trip to Philadelphia from Harrisburg. Depending on your route, your round-trip mileage may range from 213.6 to 264.2 miles — the latter of which would exceed your charge. With more charging stations, electric cars could travel farther and contribute more to the economy. The Antique Automobile Club of America Museum in Hershey, for example, is home to two Tesla charging stations and one universal station. The museum has seen a substantial number of drivers use the stations — and these travelers often opt to check out the exhibits for a few hours while their car charges, which supports the museum and the local Hershey economy. Most chargers require up to eight hours for a full charge, though Tesla’s Supercharger is an exception to this, as it can provide a full charge in a single hour to its line of cars. Both types of charging stations, however, encourage drivers to explore the local area. Tesla, for instance, notes that its charging stations are located near hotels, restaurants and shopping centers. By providing drivers with the opportunity to contribute to a local economy — whether by eating, shopping or visiting museums — that benefits Pennsylvania as a whole. Federal Tax Credits: If you’ve already purchased your electric vehicle, you can still obtain a tax credit. All-electric vehicles bought during or after 2010 are eligible for a tax credit of $7,500. Each manufacturer, however, is limited to 200,000 credits. It’s estimated that automobile manufacturers will reach this number by 2018 — especially when considering that Tesla’s Model 3 received more than 300,000 reservations. Alternative Fuel Vehicle (AFV): Pennsylvania offers rebates for plug-in hybrid electric and battery-electric vehicles. The $1,750 rebate can apply to used vehicles if their odometer reads fewer than 500 miles. This incentive is limited to the first 250 applicants who qualify. Many other states across the U.S. offer financial assistance to consumers seeking an all-electric vehicle. In fact, 25 states once provided funding for electric vehicles, though that number has since decreased to 16 as states like Illinois and Tennessee have allowed their incentives to expire mainly due to the uncertainties of the industry at the federal level. With potential rollbacks on Obama-era emission regulations for 2022 to 2025, it’s possible automakers may mimic states like Tennessee in their lack of support for electric vehicles by investing more funds into gas-powered cars than all-electric ones. Electric vehicles, however, can provide substantial benefits to state and local economies if given the proper foundation to make them more accessible to drivers. At Pugliese Associates, we have a unique and detailed understanding of the benefits and opportunities offered to Pennsylvania by the renewable energy and automobile industries. With more than 30 years of experience, we’ve built long-term relationships with, and well as earned the respect of, legislators and administrations year after year through our commitment to integrity and the public good.